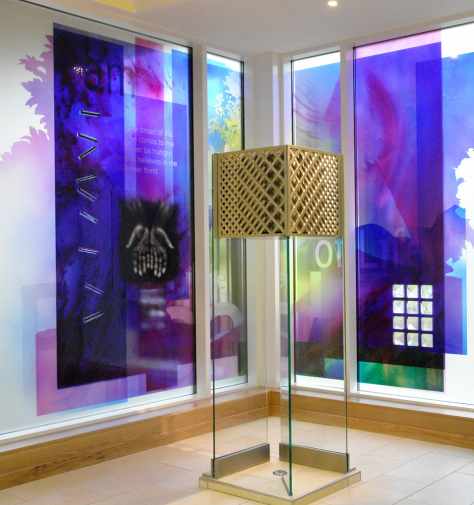 The screen to the Tabernacle area of St. Dunstan’s Church has been created to harmonize with the spirit and feel of the new building. The design is characterised by its use of bright, strong colour fields, punctuated by a variety of Christian symbols and elements, which help to underpin the importance of this area of the church, and provide a place for quiet contemplation and prayer. The Blessed Sacrament is reserved in the Tabernacle for communion of the sick and for adoration and meditation – it is the real presence of Christ. Part of the function of the artwork is to act as a still, quiet aid to worship, to help engender contemplation of the spiritual mystery of the Blessed Sacrament. In some small way, I hope the artwork will be conducive to meditation and prayer through the careful modulation of light and colour. To the left of these elements is a collection of pencil-bevelled prisms running down the left hand edge of the design. These prisms act as light catchers, to split and refract the light into a rainbow of colours. The central section of the design has the rich blues and purples of the background reduce to lighter blues and yellows. 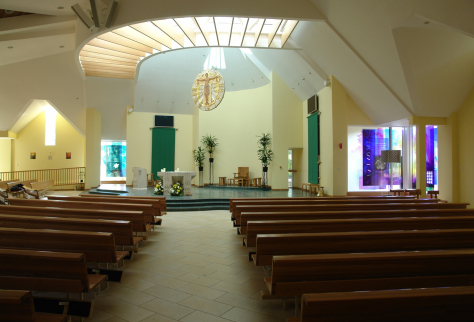 The lightest area in the central of the design is clear glass, to allow the Tabernacle to be viewed from inside and outside the church building. The right hand side of the design contains the ancient symbol Chi Rho. Of the several sacred monograms of Christ, the Chi Rho is one of the most ancient. It is generally formed of the Greek letters chi (X) and rho (P). These are the first letters of the Greek word “XPICTOC” (pronounced Christos), which means “Christ.” Below the Chi Rho are twelve pyramid prisms, with green antique glass at the bottom of the design. 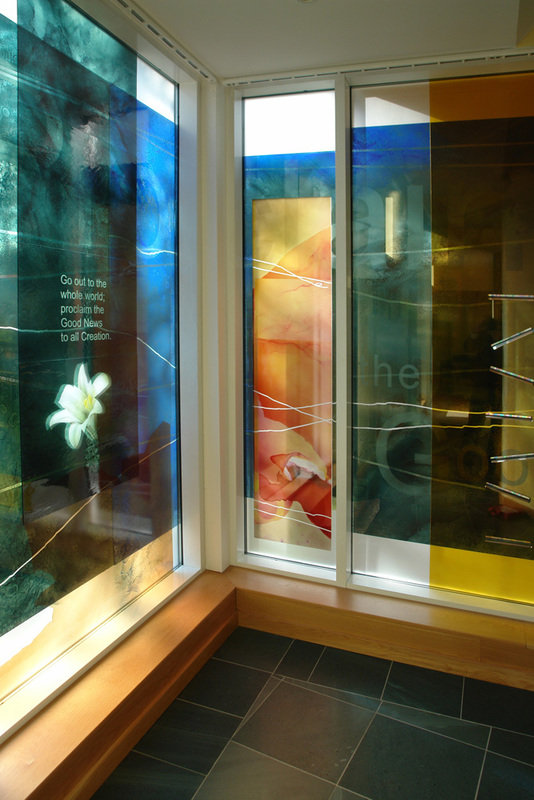 The outside areas to each side of the design are to be sandblasted obscured glass, with the central area being clear glass. 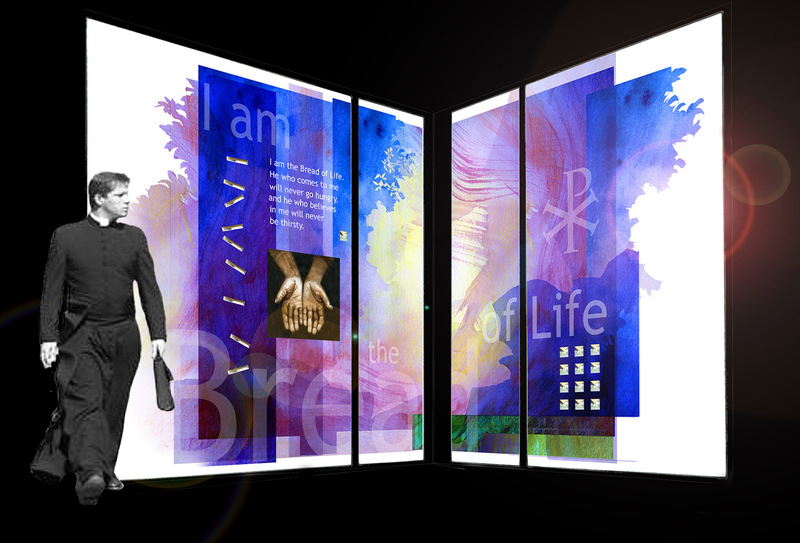 The screens are to be coloured using a combination of airbrushing or screen printed enamels, together with bonded sections of antique glass, sandblasting and hand painted details. The glass units are to be constructed with 8mm toughened glass panels, with a 12mm argon filled space. 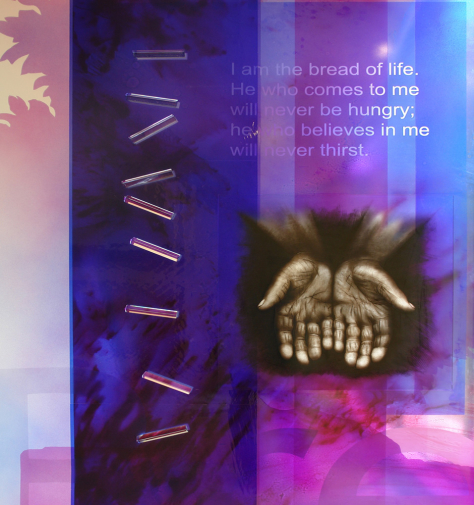 The screen to the left of the Sanctuary at St. Dunstan’s Church has been created as a companion window to the “Bread of Life” Tabernacle window. The window is located in an important connecting corridor between the pews and the Sanctuary, and is directly behind a screen containing a statue of the Virgin and Child. The design harmonizes with the spirit and visual language of the Tabernacle window and is characterised by its use of bright, strong colour fields, punctuated by a variety of Christian symbols and elements, which help to provide a focus for meditation and prayer. As with the Tabernacle window, part of the function of the artwork is to act as a still, quiet aid to worship, to help engender contemplation through the careful modulation of light and colour. The design alludes to nature with the colour palette, and there is a suggestion of leaves, of flowing water, the silhouette of trees and in particular the white lily, which is the symbol of the Virgin Mary. In the right hand section of the design a folio of the Codex Sinaiticus shows the last page of the Gospel of John. This is one of the early important tenets of the Bible, written in Greek “biblical uncials” on vellum. (Sinai 4th century AD.) and acts as a visual representation of the Good News. The right hand panel contains a collection of pencil-bevelled prisms running down the design to create movement with the passage of the sun across the window. These prisms act as light catchers, to split and refract the light into a rainbow of colours. 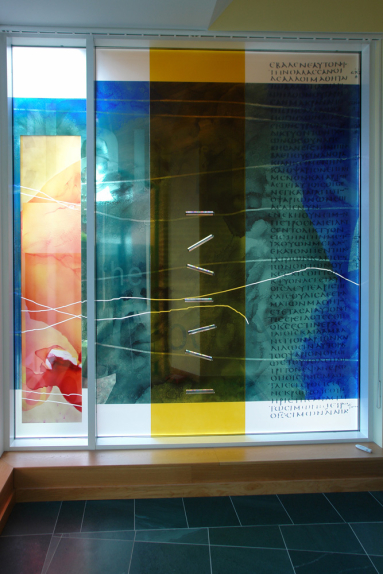 The outside areas to each side of the design are sandblasted obscured glass, to continue the theme established in the original tabernacle window.